Bilkisu qualified as a medical doctor in 2003 from Ahmadu Bello University, Zaria, Nigeria. She became a Fellow of the National Postgraduate Medical College of Nigeria in 2011. Bilkisu proceeded to Johannesburg for a one year post fellowship training at the Division of Paediatric Pulmonology, Charlotte Maxeke Johannesburg Academic Hospital, South Africa. She obtained a Diplomate in Allergology from The Colleges of Medicine of South Africa in 2012. She also completed Master of Science in Medicine with Distinction from University of the Witwatersrand, Johannesburg, South Africa in 2013. Bilkisu is a trained leader and manager after completing the Leadership and Management in Health Course from the University of Washington in 2018. She is trained and competent in Spirometry through the Pan African Thoracic Society. Bilkisu has interest in teaching and likes imparting knowledge which has been ongoing since 2006 which involves medical students, house officers/interns, nurses and resident doctors. She has co authored in over 40 local and International peer reviewed research papers with several local and International conference presentations. 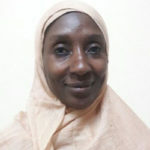 She is currently an Honorary Consultant Paediatric Pulmonologist with interest in Allergy and Senior Lecturer at Usmanu Danfodiyo University Teaching Hospital/ Usmanu Danfodiyo University, Sokoto, Nigeria. Bilkisu is married to Dr Aminu Sakajiki and have 4 children.